If the Thanksgiving season has you thinking about giving back to the community, that's great! 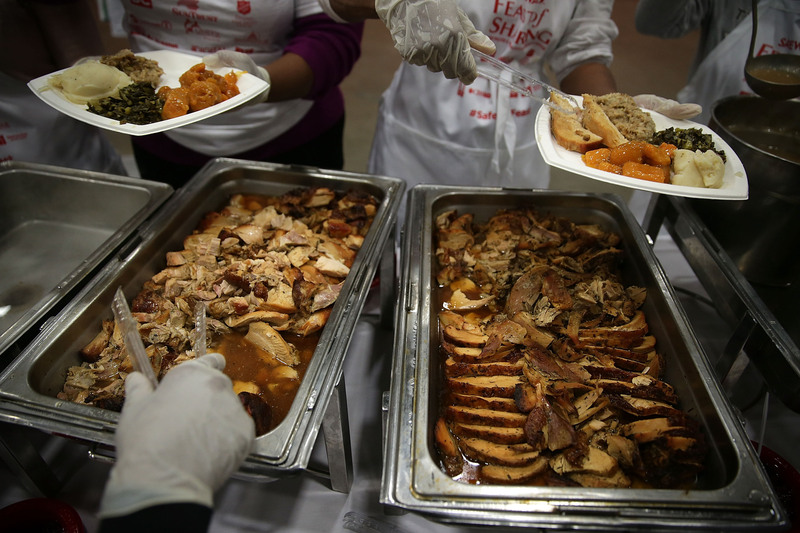 Many local food programs may be looking for extra volunteers on Thanksgiving Day. But plenty of food banks, food pantries, and soup kitchens — which are now more commonly known as meal programs — need help year-round. If you're passionate about feeding those in need, there are probably volunteer opportunities in your own community that's sure to fit your interests. But what, exactly, are the differences between food banks, food pantries, and soup kitchens? I'll break it down so you know all of your volunteer options. As Time notes, meal programs are often most overwhelmed with volunteers during the holiday season, especially the week of Thanksgiving. When these programs prepare meals for the holiday, the staff might not have time to train extra volunteers who aren't familiar with the location's policies. That's not to say you shouldn't pitch in during Turkey Week, but if you can, volunteering in the off-season, like during smaller holidays, could be an ideal way to use your vacation days for good. The truth is that millions of Americans suffer from food shortages every day, and there are plenty of ways you can help those in need in your community all year long. Whether you hold a local food drive, volunteer to pack bags at a food pantry, or offer your culinary skills to prepare hot meals at a meal program site, plenty of people would appreciate your generosity, no matter what season it is. Food banks collect and store food that are then distributed to local food pantries, charities, and meal programs. Ross Fraser, director of media relations at Feeding America, the United States' national food bank network, explains to Bustle that most hungry people don't go directly to food banks, and food banks don't give food directly to the hungry. Food banks are essentially warehouses — the hungry go to food pantries, which are stocked by food banks. So, how can you get involved with working in your community at the food bank level? You can find a local warehouse at Feeding America's website, which includes a directory of food bank networks. Food banks are always looking for volunteers — Feeding America's network distributes more than three billion meals every year across the country. Fraser emphasizes that volunteering can be more than just packaging food, too — you can use your financial savvy, for example, to help manage a food bank's books, or you could use your software background to help a food bank's IT department. And while food banks will certainly welcome food donations, Fraser explains that donating money is often more useful. "We prefer funds, because we have a lot of buying power, so it's just much more cost-efficient for us to buy food with donated funds than for someone to buy food and give it to us," Fraser tells Bustle. Food banks can often buy food for cheaper prices than what you'd find at a grocery store, so your dollar will go further to feed the hungry if you donate directly. The important distinction between food banks and food pantries is that food banks are where donations are stored, and food pantries can directly distribute food items to those in need. Food pantries put together packages of unprepared food for people who have homes but don't necessarily have the means to feed their families on their own. Fraser explains that 95 percent of the people Feeding America's network serves aren't actually homeless, but instead they struggle to keep up with their bills each month. So, food pantries can help fill a low-income family's fridge, and they can prepare meals in their own homes. Volunteering at a food pantry could be a good option if you want to work more closely with the community. Volunteers could pack food to distribute to families in need, or in some cases, deliver the food packages themselves. To get involved at a local food pantry, you can find options in your community through FoodPantries.org, which keeps a catalog of facilities across the United States. You can also search for food pantry resources through your city or state — New York City, for example, has a list of local food pantries and meal programs available on its government website. Once you find the locations near you, contact your local food pantry to see how you can help. Meal programs, which are sometimes referred to as soup kitchens (though "meal program" is the preferred term, since many don't actually serve soup), offer prepared food and hot meals to the hungry for free or at reduced prices. Volunteers could prepare meals, serve the food, or help with cleaning up. Since many meal programs are independently owned, the best way to find options in your community is to search online for meal program volunteer opportunities in your city or state. The Homeless Shelter Directory has a list of emergency food programs across the United States, including food banks, food pantries, and meal programs, so you can search for local volunteer opportunities there, too. The Salvation Army also operates a national network of soup kitchens and food pantries, so you can check their database to see if there's a meal program site near you. If you've got a busy schedule and can't volunteer on a regular basis, there are still ways you can help the hungry. Meals on Wheels, for example, provides nutritious meals to people who may not be able to leave their homes, and you can volunteer in a variety of capacities with your local Meals on Wheels group. You could help the team prepare food or deliver the meals and help keep homebound folks company. You could also donate directly to Feeding America or to your local food pantry or meal program, either in the form of money or by purchasing necessary food supplies. Another way to get involved this holiday season is to create a centerpiece for your Thanksgiving table that's made of fresh food, and then donate its contents to your local food pantry afterwards. Gary Oppenheimer, founder and executive director of AmpleHarvest.org, tells Bustle that the centerpieces are an easy way to incorporate more giving into your holiday festivities. AmpleHarvest.org works to bring fresh food to local food pantries, which mostly offer canned or dried food. Creating a centerpiece of beautiful produce and delivering it to a food pantry the day after Thanksgiving (or any holiday!) is an easy way to help the hungry share some fresh food. You can also get involved with helping the hungry by simply being an advocate. If you hear, for example, that your state is decreasing food stamp funding, Fraser says that writing to your local representative could make a difference. Your voice matters, and speaking up for the less fortunate is never a bad thing. There are plenty of ways to help the hungry in the United States, and those in need appreciate whatever you can give. It's great to help out around the holiday season, but if you really want to make a difference, consider volunteering in the off-season, too. The holiday season inspires generosity and kindness in many people, which is always a good thing, but those in need will still be in need when January comes along. Food banks, food pantries, and meal programs need support year-round, and if you can give time or money, it really can go a long way.